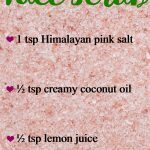 Homemade Lip Scrub with Coconut Oil - beautymunsta - free natural beauty hacks and more! Find out how you can make your own detoxifying, exfoliating and plumping lip scrub with coconut oil, right in the comfort of your own home! Your lips, just like the skin on the rest of our bodies need some extra special care, after all, they do so much for us, from talking to eating to kissing and more! The skin on our lips is constantly regenerating and the old cells (also known as dead cells) need to be removed frequently in a gentle manner for lips that look groomed and classy all year long. If we don’t take off the dead cells off our lips, it can get quite embarrassing, to say the least. The dead cells may stick together and start peeling off in large chunks. 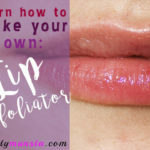 Or tiny flakes of dead cells may start giving your lips a rough and grimy texture. Scrubbing your lips also allows for smoother application of lipstick and lip balm and helps the makeup look better, last longer and prevents creasing. 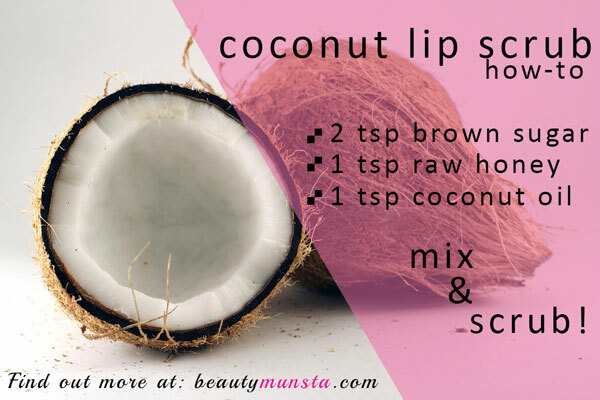 Coconut Oil is Therapeutic for Your Lips! Scrubbing your lips with coconut oil not only helps slough off dead cells but also helps to hydrate and deeply moisturize your lips so they look plump and supple for the rest of the day. Coconut oil is rich in essential fatty acids, also known as vitamin F, which are powerful antioxidants that help fight free radical damage and promote healthy repair regeneration of skin cells. Coconut oil is also naturally antibacterial, antimicrobial and antifungal so it can help prevent infections on the lips, lip rashes and sores on the lips. 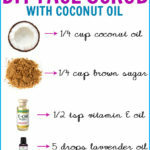 It’s incredibly easy to make your own healing and exfoliating lip scrub with coconut oil at home! You can make large quantities of it by doubling or tripling the recipe and keep in the fridge for longer shelf life. In a small bowl, measure out and place the brown sugar first, followed by the raw honey and coconut oil. 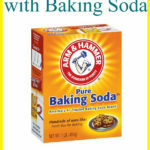 Using your clean finger, or a spoon, mix together all the ingredients until thoroughly combined. Your deliciously sweet lip scrub with coconut oil is now ready! Wasn’t that easy?! What Do You Do with Lip Scrub? Well, you scrub it all over your lips, of course! Pat your lips dry and using a clean finger, scoop up a little bit of your homemade lip scrub and rub it all over your lips. You can allow the scrub to sit on your lips for a few minutes so that it can help soak the dead cells for easier removal. Now using your finger scrub your lips using a circular or back and forth motion. Remove your lips scrub by simply washing away with water. For a more thorough clean-up, use a soft cotton wash cloth and gently wipe your lips. Your lips will now look squeaky clean, fresh, smooth, rosy and oh-so-kissable! How Long Should You Leave on a Lip Scrub? Technically, you don’t need to leave a lip scrub on for any amount of time – it’s all about rubbing it on, scrubbing it in! However, you can leave a lip scrub on for 2 – 5 minutes so that it can penetrate the skin and help soak and dislodge dead skin cells to make it easier to remove. Leaving on a lip scrub for several minutes can also help the ingredients to penetrate deeper into the skin, supplying your lips with vitamins and nutrients that can help them look nourished, radiant and healthy! How long can you store homemade lip scrub? Your homemade lip scrub with coconut oil can be stored in a clean, dry glass container for up to 2 weeks. Make sure to keep the lid tightly screwed to keep out air which can oxidize the coconut oil and make the brown sugar clump up. What’s your favorite lip scrub recipe? Share in the comments below!